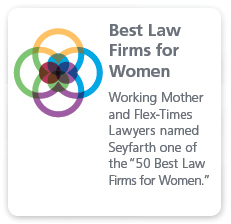 Seyfarth Shaw's Product Liability & Complex Tort attorneys bring a broad range of experience in successfully defending manufacturers, retailers and distributors against individual and multi-plaintiff lawsuits, including class actions. As a full-service national law firm, we are well positioned to defend our clients in multi-state and “copy-cat” litigation and frequently alert our clients to cross-jurisdictional trends in the areas of product liability and complex torts. Our clients—both international and domestic—hail from various sectors of industry involving a wide variety of products, raw materials and component parts, such as medical devices, pharmaceuticals, food and dietary supplements, construction supplies, heavy machinery, chemicals, metals, transportation equipment, pesticides, paints and other household products. Litigation involving a company’s products can be threatening to its bottom line, business operations and reputation. We help guard against this threat by providing our clients with strategic, fast-thinking litigators to maximize success while providing efficiencies that come with our breadth of experience. We fully assess the short- and long-term consequences of potential defensive strategies for each case, and approach matters with a comprehensive, organized strategy that maintains the integrity of our clients’ goals. Our attorneys use the know-how and skills required to help clients manage and lower risks of potentially damaging claims. We offer extensive counseling and audits in such areas as facilities and equipment safety, product labeling and literature, employee training, disclaimers, advertising, product recalls and clinical trials—all aimed at lowering the potential for liability. We also advise clients in establishing proper procedures, documentation and compliance to avoid trouble. As a result, our clients are positioned to prevent costly claims before they happen. When claims are unavoidable, our experienced attorneys handle complicated cases efficiently and successfully in numerous trial court and appellate venues and in regulatory proceedings involving complaints and recalls. Our attorneys also can develop accident and mass tort contingency plans as well as media and public relations procedures. We are committed to providing our clients with a high level of customer service and value. 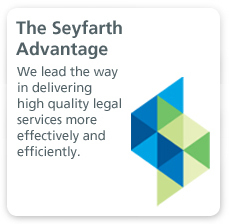 Apart from our extra efforts to be inclusive, accessible and responsive, we have applied the SeyfarthLean approach to maximize efficiencies and streamline billing. In particular, we use product liability process mapping, right-sized and cross-disciplinary staffing, flat and fixed fees, and matter management to protect our clients’ bottom line. Our clients include international and domestic manufacturers, distributors and retailers of products, raw materials and component parts, such as medical devices, pharmaceuticals, food and dietary supplements, construction supplies, heavy machinery, chemicals, metals, transportation equipment, pesticides, paints and other household products. 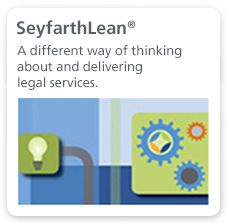 Seyfarth's Workplace Safety and Environmental Law Alert Blog is a resource for companies looking for news behind the headlines on environmental and safety issues affecting their business.